Last winter Alex and I went to New York City to celebrate our 1 year anniversary (Read about it here!). Throughout the week we visited some of the restaurants and bakeries with infamous food items that I had been dying to try forevaaa. But one of the best things we ate was not planned at all. It was Christmas Eve, a cold, rainy morning, and Alex and I needed to get breakfast before we flew back home in the afternoon. All week we had been getting a quick bagel and cream cheese for breakfast, because who has time to sit down for breakfast when you have NYC to explore? But on the last day we decided to indulge in a normal breakfast, and wandered into a nearby restaurant, Le Pain Quotidien. And forever my waffle world was changed when I tried their Belgian Waffle. Ok so give the girl who had never had a true Belgian waffle before a hot second to talk about this waffle. As soon as our waitress set the waffle down on the table, I was immediately thrown off. A single waffle, only a couple inches in diameter. The top was sprinkled with powdered sugar, topped off with a few slices of fruit, and no syrup to be seen. Like, why was there no syrup?? Also, the small size of the single waffle really made me sad because that meant Alex would probably only let me try a single bite. Too bad I had only ordered a green juice, banking on the idea I would be able to weasel a few bites from his meal. But the bite that I was able to steal, was AMAZING. True Belgian waffles are NOTHING like America’s “Belgian” waffles. Seriously, night and day. With sugar already built into the batter, I understood why it wasn’t served with syrup, but rather just a light dusting of powdered sugar. That breakfast was our last meal in NYC, and I couldn’t stop thinking about this waffle all the way home, contemplating what it took to make a real Belgian waffle. (Clearly I forgot about Google because I didn’t even think to look it up…). But then my dream of eating another authentic Belgian waffle floated to the back of my head as time went by. 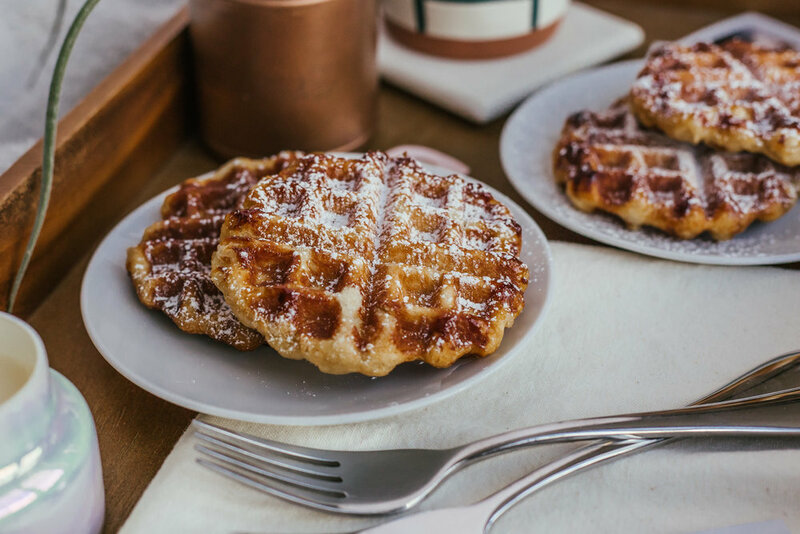 BUT then as I was reading through Molly on the Range recently, I found a recipe for Belgian waffles, and those waffle dreams came flying back at full speed into my head. So apparently there are 2 different types of Belgian waffles (who knew right?) – the Brussels waffle and the Liège waffle. Based on the descriptions I found, we had eaten a liège waffle at Le Pain Quotidien. Both Belgian waffles are yeast based, but liège waffles are sweeter, thicker, and more rich. The secret ingredient? BELGIAN PEARL SUGARS. These crystallized pieces of sugar caramelize in the waffle as it cooks, thus creating little pockets of sweetness. These pearl sugars are kneaded into the dough right before you divide the batter for the waffle iron. Overall these waffles take more work than those waffles you would make from a Bisquik box, which is why they are perfect for a romantic breakfast in bed (or any other special occasion). The waffle batter requires rising time, which I like doing the night before in order to minimize the amount of work needed to be done in the morning. (Because less work in the morning means these waffles get into your belly quicker!!). Overall I think these authenic liege waffles are COMPLETELY worth the work – trust me. In a small bowl, combine the warm water and 1 teaspoon sugar. Sprinkle the active dry yeast on top, and allow to sit for 5 minutes. The yeast should become foamy, but if it doesn’t after the 5 minutes, the yeast is likely dead, so start over with a new packet. Fit an electric mixer with the whisk attachment. Whisk together the flour, 1 Tablespoon sugar, and salt. Make a well in the middle of the flour and add the yeast mixture. Whisk until combined. In a separate small bowl, mix together the eggs, oil, vanilla extract, and almond extract until combined. Fit the electric mixer with the bread hook attachment. With the electric mixer on low speed, gradually add the wet ingredients to the flour mixture. Continue kneading until the dough is smooth and sticky (~ 7 minutes). Oil the inside of a large bowl. Transfer the dough to the bowl, and cover with plastic wrap. Let the dough rise until doubled in size at room temperature for 2 hours or refrigerate overnight. If you choose to refrigerate overnight, allow the dough to sit at room temperature the next day for 1 hour. Once dough has risen, knead the pearl sugars into the dough on a lightly floured surface. Let rest for 10 minutes. In the meantime, prepare the waffle iron. Cut the dough into 8-16 pieces (depending on how big you want the waffles), and roll each into a ball. Cook each ball of dough in the waffle iron until golden and crispy. This post contains affiliate links. See affiliate disclosure for additional information.